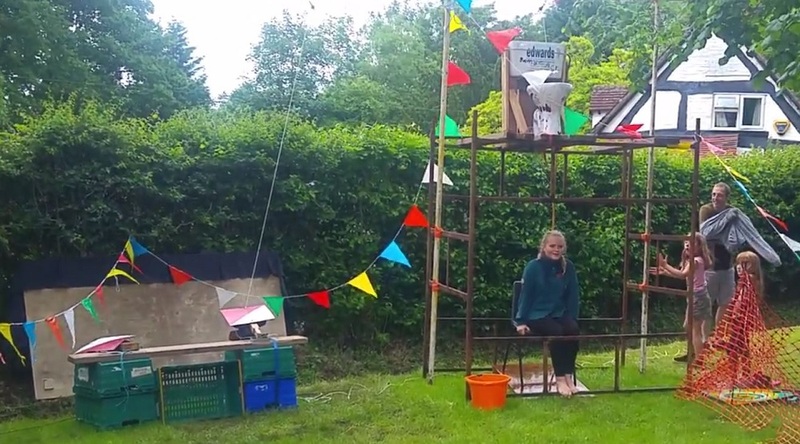 For the last few years the organisers of the Ullenhall Church Fete have asked Tanworth Scouts if they can come along and help out with running activities. This year we had a good turnout with 7 Scouts, 3 Cubs & 4 leaders in attendance along with visits from former Scouts and District comisioners. The Scouts & Cubs ran a few of the stalls including Welly Wanging & Hook a Duck, sold chocolate & sweets for Henley Chocolate (I'm assured it wasn't them that are all the samples) and were generally helpful, promoteing Scouts to the community. But it was our main Scout stall that got most of the attention. Nicknamed 'The Towering Toilet of Terror', it's what you get when some Scouts try to rethink the traditional 'Soak a Scout' stall. A toilet sits on an 8ft hight scaffolding tower with the flush mechanism attached to a target. An unfortunate Scout (Cub or leader) sits under the toilet and visitors pay £1 to shoot arrows at the target (not the Scout). If you hit the target, the toilet flushes... right on the Scouts head! Video speaks louder than words so scroll down for a couple of clips. All in all, a great afternoon was had. Most Scouts, Cubs & Leaders had several turns under the toilet. We ran some great activiites, gave out loads of leaflets about Tanworth Cubs & Beavers and raised £62 in the process! Thanks to all the Scouts & Cubs for coming along and helping to make it such a great day.